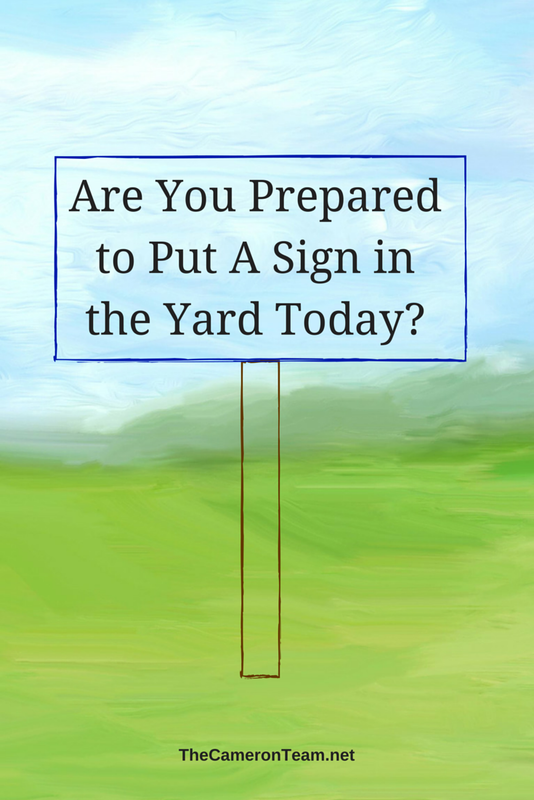 Are You Prepared to Put A Sign in the Yard Today? I was reading through some insider blogs today when I saw one with the above title by an excellent agent in Franklin, TN. Now, this was a members-only blog post, but in summary, she spoke about an agent that would bring a sign to every listing appointment. When the owners opened the door, she’d be standing there leaning on it, just to show that she was ready to list their home if they were ready to put a sign in the yard that day. You may be thinking, “Wow! That’s forward!” or you may be thinking, “Now, that’s the kind of enthusiastic personality I want!” Either way, there’s one simple fact that we often face with listings – rarely are they ready to be listed the day of the listing appointment. Even homes that have been beautifully well kept are in need of some changes, if it’s a small repair like chipped paint or a new furniture arrangement to help highlight the home’s space. No home is perfect, and we won’t force you to put a sign in the yard today. The role of a real estate agent is as an advisor and representative in negotiations. After all the facts are presented, it’s up to the seller to decide what repairs to make prior to listing, how much to list the home for, and what terms to agree to if an offer is presented. That’s why we try to leave sellers as educated as possible about their current situation. If we need to bring in a third-party, like an attorney or stager, we will. Matter-of-fact, we offer a complimentary 3-hour staging consultation with every new listing so the seller has an idea of how to make the most of their home’s layout when presenting it for sale. So, if you aren’t sure if your home is ready to be listed, don’t worry about it. We’re happy to take a walk through the home and give you an idea of what might need to be done and what may be better to leave as-is. If it’s something that you feel is out of your abilities, we have some great handymen that we’ve been working with for years. We can get you connected with someone who has the knowledge and expertise. Sometimes it takes a few weeks for a home to be prepared for listing. Of course, if you can’t make selling right now work, it’s better to know what you’re facing down the road so you’re prepared. Are you interested in learning more about listing your Wilmington area home for sale? Give us a call or send us a message through our Contact page. We also have a number of free reports with tips on preparing your home for sale, including how to Avoid the Top 10 Selling Mistakes and The Seller’s List of 25 Easy Fix-ups. If you have any questions, let us know!